Honey Bunch of Oats is the most preferred cereal at our home but it's carbon foot print must be enormous! From time to time, I get up caught in the "Be Indian Buy Indian" slogan of yesteryears and want to buy only locally made products from Indian companies, not MNC in India. The 24 Mantra ones are OK, but not what I would call a resounding success with Gau/Ash. I have to chop up nuts, fruits and add a fistful of chocolate chips before Gau deigns to relish the cereal. (I can always yell him into submission. unpleasant. Want to save it for higher goals). Organic food getting mass produced seems to go against the very grain of being small and sustainable. If my terrace garden basil dies, I will use mint or coriander for the pasta, but if I were running a restaurant, I would probably buy it outside, organic or not, just to keep my clientele happy and my employees engaged. 24 Mantra claims to be different but Volkswagen was supposed to be all about excellent engineering not data manipulation to get expected results. 1. Ragi/Jowar too weirdly crunchy (actually hard in places). 2. Popped Amaranth leaves (not leaves mind you, seed :D ) a floury taste in the mouth after it is soaked in milk. 3. I am utterly useless at figuring out how to cook/use lotus seeds. 5. You might think toasting the raisins with sugar and oil/butter will pump it up. It doesn't, Trust me. It tastes burnt and your child insists on spitting each burnt raisin into your hand. 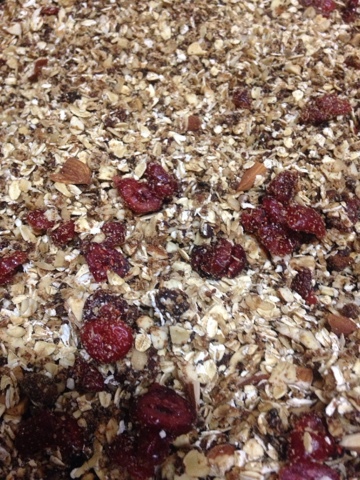 So, Now, The new, improved, eminently adaptable version of my granola with guidelines. 2. Use sunflower oil/butter about a teaspoon to every cup of grains. Avoid EVOO, the flavor is lost, not worth the expense. 3. Use about 1/8 cup nattu chakkarai, powdered jaggery for every cup of grains. 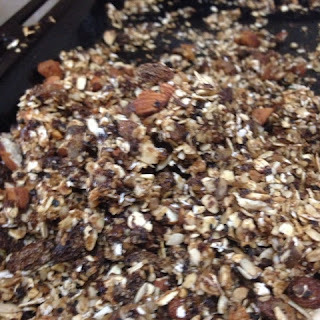 The jaggery melts into a syrup and lifts the granola to a sublime level. 4. Use almonds, cashews, pistachios, melon seeds etc... generously. 5. Use about a spoon of honey per cup of grain. 6. Get your hands in and mix thoroughly. 7. Bake at 350 F for 20 minutes, stirring 2 - 3 times. Switch off let sit for another 10 minutes. Take out, leave undisturbed until cool, then add dry fruits. 8. Serve with chocolate chips and sliced fruits. Pour into a 9" buttered pan, press down and bake for 20 - 30 minutes, until edges brown. 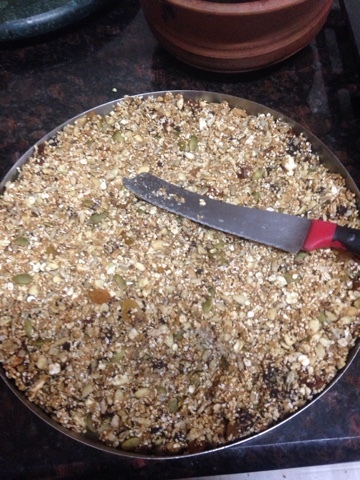 I used sunflower, pumpkin seeds and cashew nuts in this version; Dates and raisins for the dry fruits.